What is Artificial Grass Infill and What are the Types? - Lawn Kings Inc.
What is Artificial Grass Infill and What are the Types? Home/blog/What is Artificial Grass Infill and What are the Types? Natural grass blades are resilient and typically grow upward when healthy and well-watered. When activities occur on the surface the blades will return to the original position and shape as part of the normal growth process. Synthetic grass obviously doesn’t have the growth process described above and yet it blades need also a means to remain in the original upright position in order to look good and natural. This is essentially a mechanical function performed by the infill. The function of the infill is to keep the artificial turf as good looking as possible for as long as possible. 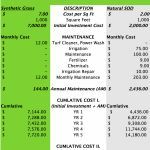 What is Artificial Grass Infill? Infill normally refers to the products that are placed in between the blades or fibers of artificial turf, or the synthetic grass blades. The purpose of infill as mentioned above is to help the grass blades stand up, or return back to their intended upright position after they have been exposed to pressure. Additionally, infill helps to shield the backing used on artificial turf from the damage that is caused by UV rays. Infill helps maintain the look of synthetic grass but also helps give it the feel of natural grass. Infill mimics the impact absorption qualities of the soil under real grass so that it will feel as if you are walking or running on real grass. Another benefit of infill is that it helps to weigh down artificial turf as a ballast to prevent it from developing wrinkles or ripples that can occur because of movement. It also aids in drainage, which means you won’t have to deal with pooling or standing water after it rains. Artificial turf infill is recommended for any synthetic grass installation. It is the material used to put between the blades. It fills in the space between the grass blades and has several other functions as well. Infill helps the aesthetics of your turf by keeping the blades upright. Infill makes the yard springy, which makes it more comfortable for children and pets to play on. Infill protects the artificial turf’s foundation, so it helps your synthetic lawn last longer. Infill prevents or eliminates pet odors! There are several types of infill used in synthetic grass. Each type is intended to provide the same benefits; however, some do a better job than others at delivering these benefits. Here’s a look at some of the different types of infill materials that are commonly used in artificial grass. Silica sand is derived of quartz that has been eroded by wind and water. As the quartz erodes, it breaks down into small granules. 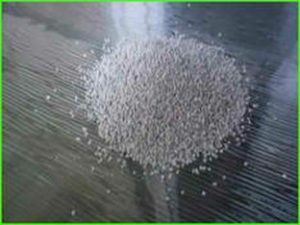 This material is used in several commercial applications, including artificial grass infill. Silica sand helps keep the blades of artificial grass standing in an upright position as do other infill types. Another benefit of this type of infill is its cost; generally, it is the least expensive type of infill material. However, there are some downsides to this type of infill product. 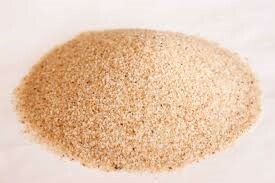 The sand is not rounded, but rather angular and so may lead to premature fiber breakdown. It tends to harbor moisture which can lead to bacteria growth on the surface and develop mold and mildew. The composition of the sand can also harden, which means that your artificial grass can end up losing its permeability. Lastly, it has been known to trap pet odors, so if you have pets, you may want to avoid this type of infill. Crumb Rubber is a popular infill for artificial turf used in sports applications. 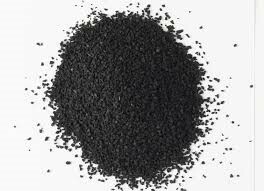 Often recycled tires are ground into very small granules. This gives the turf a unique bounce and so it’s often used on sports fields and other high traffic areas. However, rubber can trap odors and heat, making the area of usage even warmer than usual. Unfortunately, it can also result in black dust on clothing, shoes, towels, and patio furniture. Rubber also doesn’t kill any bacteria and it absorbs sunlight and can make a yard hot. Zeolite is a non-toxic, child and pet safe volcanic mineral that has moisture absorbing properties. Zeolite is a popular artificial turf infill choice by pet owners. It is similar in function to kitty litter. We offer the “Triple Z” brand of Zeolite and it Is an odor absorbing and USDA approved product. Essentially it prevents odors by capturing ammonia in the urine and not allowing it to turn into a gas. Zeolite is a 100% natural product. Zeolite has a negatively charged honey-comb molecular design which it different from other infills. This molecular form allows it to absorb urine while trapping in the ammonia gases that cause the foul odor from pet urine. Zeolite suppress and hold onto the gases until water releases it. 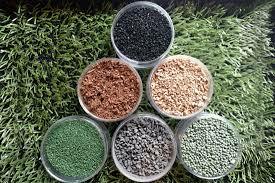 Acrylic coated sand is another popular choice when it comes to artificial turf infill. We offer the Envirofill® products. The antimicrobial protection is accomplished with Microban® technology. It prevents against the bacteria and microbes that can cause heinous smells, deplorable stains and negative effects on the integrity of your artificial turf. 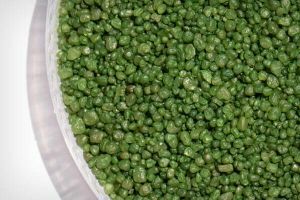 CA Prop 65 exempt – No Dust! 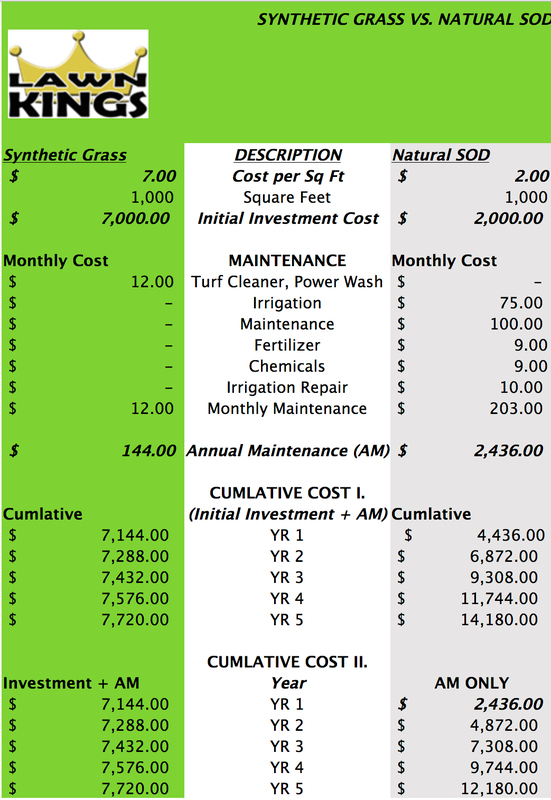 Consider the artificial turf use or application. Always buy a certified product. Generic products could result in weeds. Seek professional help to install it the synthetic grass infill, your artificial grass warranty may not cover your lawn if you try to lay the infill yourself.